Grass is green. The sky is blue. Pro Skills finds hidden gems. At this point, the Dallas-based EYBL program's ability to find uncover talent is like no other, and they have a next-man-up. J'Wan Roberts is the latest Pro Skills' project to come through the machine, and it turns out he is no project at all. Since arriving on the circuit in 2015, Pro Skills has had numerous prospects enter their program as a relative unknowns, only to eventually turn into bonafide high-major prospects. After four games, it's evident that Roberts could be next. The 6-foot-6 uber-athletic junior may not be the tallest frontcourt player on the circuit, but his length, athleticism and natural shot-blocking ability helped separate himself from the pack at EYBL Dallas. Playing close to home, the Killeen Shoemaker (TX) high school product displayed a great basketball IQ, doing the little things at both ends. Roberts was solid offensively, averaging 14.0 points on 58 percent shooting. On defense, he was exceptional. Roebrts averaged 3.8 blocks per game while contesting countless others. He was a beast on the defense boards (8.2 RPG), using great positioning with unmatched physicality to secure rebounds at an efficient rate. Roberts' energy was infectious and his motor stood out, securing numerous loose balls in close games. He was never rattled, and took every advantage of playing close to home to open his EYBL career. Most importantly, he managed that production while staying out of foul trouble. "J’Wan was a huge part of our success on both ends of the court," said the Pro Skills' coaching staff. "His physicality inside sparked our team to play with the attitude and toughness needed to compete and win." The lengthy list of prospects that have blown up late in their high school careers with Pro Skills include names like Andrew Jones and Jarrett Culver. Add an evolving Roberts to the list, but he's not the only member of Pro Skills primed for a breakout. Junior big man Tylan Pope was also tremendous in session one, as was backcourt teammate Jordan Wright, who earned All-Dallas Honorable Mention along with Roberts. 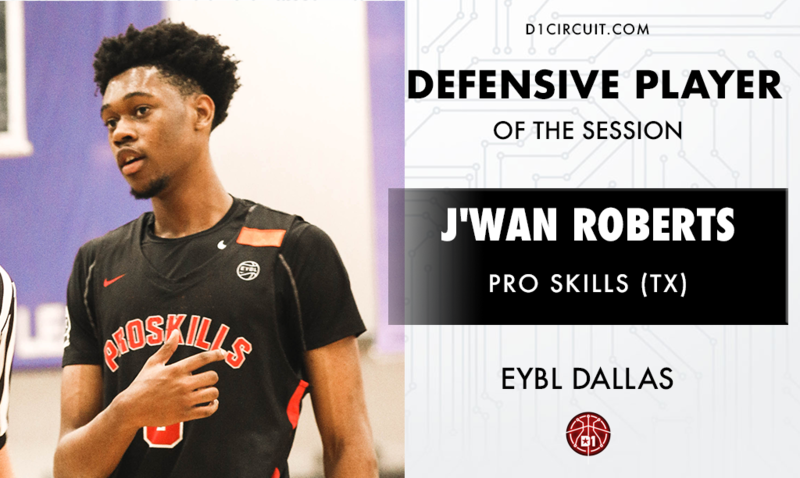 Give J'Wan a follow on twitter and follow him & and his Pro Skills teammates as they head into EYBL Indianapolis.